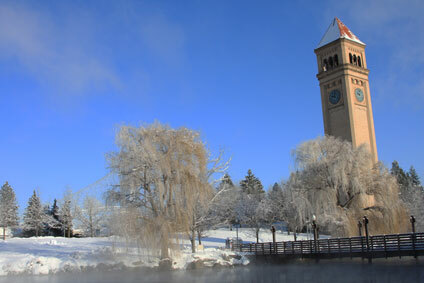 Warm summers, snowy winters, sumptuous views from all angles make Spokane, WA a paradise for those who love the outdoors. With plenty of trails to hike in the warmer months and skiing and snowboarding at Mt. Spokane when it snows, the area has a little something for everyone all fours seasons year round. When it’s time to spend time at home, however, you can keep the outdoor living going from the comfort of your Global Solarium sunroom. The glass-enclosed structures keep you comfortable no matter the time of year and allow you to take in the sun, snow, and maybe even spy a deer wandering by. With high-performance dual pane glass, integrated shade track system, and a quadruple built-in webpage system, Global Solarium sunrooms ensure the climate outdoors won’t affect your comfort indoors. Sunrooms add extra square footage to your home’s living area and are bathed in natural light. Global Solarium sunrooms come in three styles – Edwardian, Georgia, and Victorian – and all offer several options to make the room your own. All styles are energy efficient and are built with old-word craftsmanship using modern design and technology. The Edwardian style offers a more modern look, with square or rectangular floor plans. Georgian rooms offer a more unique look and are often referred to as cathedral style conservatories. Victorian conservatories are the most distinctive style Global Solariums offer and can incorporate finials, copulas, and even rounded floorpans. Sunrooms can be built with vinyl, aluminum, or wood interiors and offer several door options, including French doors, sliding doors, and single swing doors. Proper ventilation is a must in any sunrooms, so manual, electric and even exhaust vents are available. Sliding or single-hung windows round out the options and can be clad in vinyl, aluminum, or wood to keep consistent with the over look of the room. Contact Global Solariums for more information.